After cycling and hiking in Dali, exploring the old town of Lijiang, and trekking Tiger Leaping Gorge, our Yunnan trip rolls on. 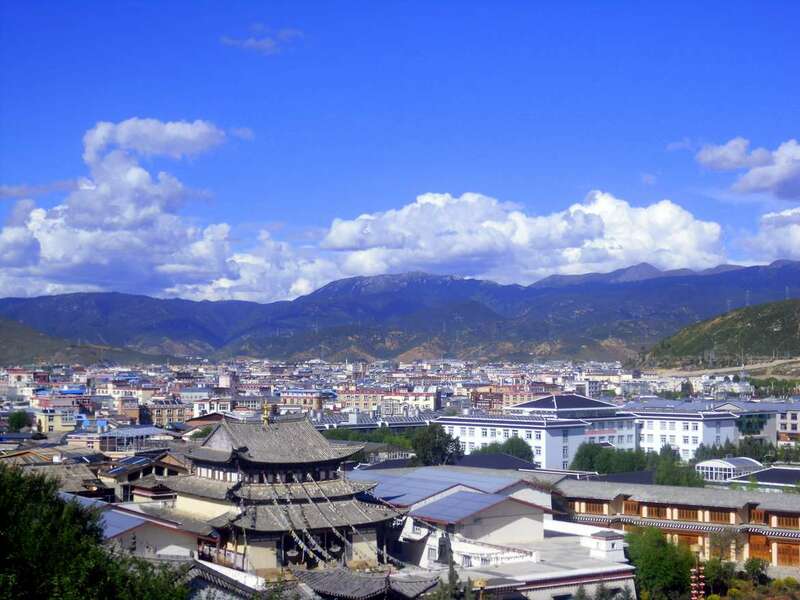 Shangri-la is a small town nestled in Yunnan’s northwest corner. It was originally named Zhongdian, but they officially changed the name in 2001 in an effort to increase tourism to the area. Most people know Shangri-la as the mythical place described in James Hilton’s novel “Lost Horizon.” There has been much debate over the true location, with Tibet, Sichuan and Yunnan all laying claim. Whether or not it is really the place that inspired Hilton’s novel, it’s definitely worthy of a visit. Of course, there’s something you should know about this town first. Have you been to Shangri-la or read the book? They’ve still got a long way to go. Unfortunately, half of the old town burned down in early 2014. Efforts to rebuild it have been going on ever since. It is still possible to visit and see the remaining half, and hopefully it will be totally rebuilt within a year or two. Most of the structures in town were made almost entirely of wood, and it’s said that someone’s hot plate started a fire when they fell asleep. Many of the buildings were closer to each other than they should have been, which made it incredibly easy for the fire to spread. Let’s hope they have some more foresight when rebuilding. Even though much of the town is still under construction, there’s plenty to keep you busy here. There are two temples in the town that were untouched by the fire – the Golden Temple and the Baiji Temple. The Golden Temple has the world’s largest prayer drum and it takes at least six people to spin it around. It has three different buildings with the main building displaying a large Buddhist statue. The views of the town from up here are fantastic and are well worth the short hike up. The town looks great from up here! Baiji Temple is translated to “100 Chickens Temple” as there are many chickens running around the temple grounds. It is just up the hill from the Golden Temple. It also offers great views of the town and surrounding mountains. We didn’t make it up there, so we can’t confirm exactly how many chickens call the temple home. Both of the temples offer some aspects of the Songzanlin Monastery for free. The monastery is probably the biggest attraction in the town, but we decided not to visit because of the high ticket price. Plus, we also read that it was more of a tourist trap than an actual monastery. Apparently, monks there ask you for money, which is something we’ve never experienced after visiting countless temples and monasteries in countries like Thailand and Cambodia. Rather than sign up for an overpriced tour of the monastery, we decided to rent some wheels and make our own fun. Many of the attractions lie outside the town in the surrounding area. One such place is Napa Lake. Located about 5 kilometers from the town, it’s possible to rent a bicycle and visit on your own two wheels. The circumference of the lake is 23 kilometers, but the entire loop around the lake and back to the town is more than 40 kilometers. It’s a great way to get some exercise and get up close with nature and animals. The water level is lower in the fall and winter so it’s possible to see sheep and cows grazing in the lake bed. A few scenes of our day around the lake. Many other types of wildlife can be seen here such as different bird species and even yak. Tibetan style houses dot the perimeter of the lake, housing all the Tibetan people living in the area. The admission is free, however some people have started to make checkpoints where they stop visitors and ask for a 60 yuan fee. Nobody ever asked us to pay, which is good because we’ve paid plenty of extra fees in China already. On the other side of the town is Pudacuo National Park, the first national park in China. After doing a bit of research, we opted out of this attraction also because of the inflated entrance ticket. Other reviews say that it’s not really possible to get out there and enjoy nature, as in typical China style it’s forbidden to stray from the path. As Americans, we’re spoiled with our national parks and we figured this would be a disappointing and expensive outing. After visiting the Joshua Tree, Grand Canyon, Zion, Bryce Canyon, Canyonlands and Arches on our gap year, we’ve got high expectations out of national parks. When you’re not temple hopping or cycling, simply wandering around the town is entertainment enough. If you can’t make it to Tibet, you’ll still be able to soak up quite a bit of Tibetan culture here. Many Tibetan people live here and you’ll see them out with their traditional clothing on. You’ll also see Tibetan writing on many businesses, including KFC. Just under the Golden Temple, you’ll find the town square. There’s a museum of culture here, which isn’t anything special but is worth a quick look. In the square, you can pose for a photo with a yak or don some traditional clothing. As we tend to do, we wandered into a colorful place across the street. From the outside, it appeared to be yet another temple. Going in for a closer look reveals something slightly different. Inside, we found several statues and paintings showing monks and local people alongside Communist Party officials in very harmonious scenes – shaking hands, singing, and dancing. Monks and Communist Party officials are good buddies! In a country with tons of issues between ethnic groups – especially with Tibet and Xinjiang – the Chinese government likes to show that everything is just fine. It’s hard to remain silent on the matter, but it’s best not to state your opinions of Tibet while you’re in China. We’re not here to start a geo-political argument, though – we’re here to tell you what to do in this beautiful town. In the evenings many local people converge on the square for dancing and socializing. Anyone is allowed to join and most of the dances are traditional Tibetan style. A scenic bus ride in. While there is an airport here, if you’re backpacking around Yunnan you’ll probably end up here by bus. It’s easy to get a bus here from any of the other major destinations, such as Dali or Lijiang. We ended up stopping in the little village of Haba for a night after the Tiger Leaping Gorge and catching a bus from there. While the ride was a bit terrifying, the views out the window were amazing. There are plenty of hostels, guest houses, and hotels here to choose from. We ended up staying at Tavern 47, a beautiful hostel run by a Naxi woman and her Korean husband. We had a nice, comfortable private room, and we thoroughly enjoyed their mouth-watering yak burger. Despite the tragedy of the fire in the old town, Shangri-la is still a great place to visit and experience true Tibetan culture, without the hassle of added permits and required tour guides that entail an actual trip to Tibet. If you’ve got extra time, energy, and funds, there are plenty of options for adventure around here. You can go horseback riding or hiking, do home stays with local families, soak in hot springs, and much more. We were pretty drained physically and financially after 14 months on the road, so we opted to take it relatively easy on our short stay. All in all, the backpacking trip from Kunming to Shangri-la was one of our highlights of 5+ years living in China, and an experience we highly recommend if you decide to travel to the Middle Kingdom.